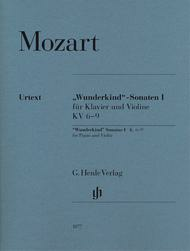 Wolfgang Amadeus Mozart - Wunderkind Sonatas, Volume 1, K6-9 (Piano and Violin With Marked and Unmarked String Parts). Composed by Wolfgang Amadeus Mozart (1756-1791). Edited by Wolf-Dieter Seiffert. For Violin, Piano Accompaniment (Score & Parts). Henle Music Folios. Softcover. G. Henle #HN1077. Published by G. Henle (HL.51481077).Wolfgang Amadeus and his sister Maria Anna were admired as being prodigies. The piano sonatas “with violin accompaniment” K. 6-9 were composed in Paris in 1763.